The Andalucian city of Seville delivers a stunning destination for the short break visitor. This city has the lot, an artistic heritage and incredible history plus a great nightlife with an exciting and enviable vibe. This is the heart of Andalucía, here you can really feel the pulse of Spain, it is the home of Flamenco, the Spanish guitar, wonderful tapas bars as well as great architecture that reflects the history and heritage of the city and region. The ancient pastime of bullfighting is still performed in the Plaza de Toros but nowadays it is La Liga football that incites more passion from the citizens of Seville. As if all these attributes were not enough; the climate is superb all year round (a little too hot in July and August) and the city is home to the best fiestas in Spain. The amazing processions, solemnity and traditions of Holy week are fantastic to behold and the subsequent party of Feria de Abril held every April should be on every travellers must do list. The city is clean and modern with several narrow streets dotted with chic boutiques and designer stores. As in other major Spanish cities you will find an array of shops and large department stores such as Corte Ingles yet as you wonder around Seville you can stumble across an ancient plaza or an example of stunning architecture that dates back hundreds of years. As if to emphasise the contrasts of ancient and modern you can travel on a modern city tram way or ride on a designated bicycle only road that passes in front of the city's cathedral home to the tomb of Christopher Columbus. A 'hop on hop off' open top city tour is a reasonable way to acquaint yourself with the major sights and attractions of the city, these are available for 24 or 48 hours duration. There is an electric bike tour and several recommended walking tours too. Once you have got your bearings you will need to visit the Alcazar with its amazing historic buildings and grounds right in the heart of the city, the nearby Cathedral is also superb and a stroll around the Barrio Santa Cruz is also a must. The breath taking Plaza de Espana should be on your list too. Seville is blessed with several museums including the Museum of Fine Arts. If you like music and dance the highlight of your visit could be the Flamenco show at the Cas de la memoria Al-Andalus or a visit to the Casa de Guitarra. Check out Maria Luisa Park, the Plaza de Toros and the university all are worth the time. Don't forget to spend some time in the authentic tapas bars and watch the world go by! Weekends and short breaks are popular all year round, however the mild climate makes autumn and spring breaks an ideal time of year to explore this fascinating city. Expect to have to book early and pay higher prices for Easter/April dates. 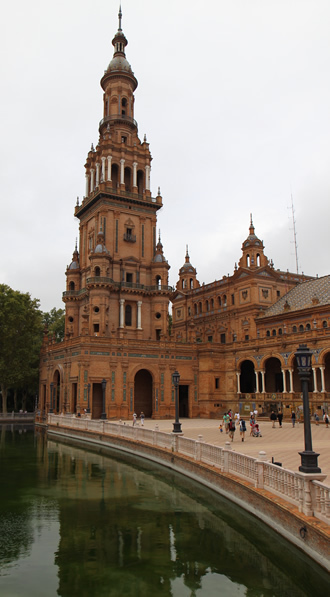 Seville is only just over a couple of hours flying time from the UK and with the availability of low cost airlines from London Gatwick it makes the trip to Seville a convenient and reasonably priced experience. There is a good range of accommodation in Seville from simple Hostals through to a range of stunning 5 star deluxe hotels. The train service from Granada, Madrid and Malaga give you the possibility of arranging a multi centre holiday please call us to arrange your personal itinerary alternatively or Click here for a quick quote. Travel Empire's favourite spots in Seville; Hard to choose from the 400 or so tapas bars on offer however our personal favourite is the popular Bar Modesto that gets our vote! The White Bar near the University also hit the spot.